The Great Plains is the broad expanse of flat land, much of it covered in prairie, steppe and grassland, that lies west of the Mississippi River and east of the Rocky Mountains in the United States and Canada. This area covers parts of the U.S. states of Colorado, Kansas, Montana, Nebraska, New Mexico, North Dakota, Oklahoma, South Dakota, Texas, and Wyoming, and the Canadian provinces of Alberta, Manitoba and Saskatchewan. 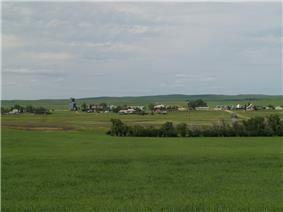 The Canadian portion of the Plains is known as the Prairies. Some geographers include some territory of Mexico in the Plains, but many stop at the Rio Grande. When considered as an ecoregion, the Great Plains extend farther into the Canadian provinces and into northern Mexico, as well as into the states of Illinois, Indiana, Iowa, Minnesota and Missouri. The region is known for supporting extensive ranching and agriculture. The term "Great Plains" is used in the United States to describe a sub-section of the even more vast Interior Plains physiographic division, which covers much of the interior of North America. It also has currency as a region of human geography, referring to the Plains Indians or the Plains States. In Canada the term is little used; Natural Resources Canada, the government department responsible for official mapping and equivalent to the United States Geological Survey, treats the Interior Plains as one unit consisting of several related plateaux and plains. There is no region referred to as the "Great Plains" in The Atlas of Canada. In terms of human geography, the term prairie is more commonly used in Canada, and the region is known as the Prairie Provinces or simply "the Prairies." The North American Environmental Atlas, produced by the Commission for Environmental Cooperation, a NAFTA agency composed of the geographical agencies of the Mexican, American, and Canadian governments uses the "Great Plains" as an ecoregion synonymous with predominant prairies and grasslands rather than as physiographic region defined by topography. The Great Plains ecoregion includes five sub-regions: Temperate Prairies, West-Central Semi-Arid Prairies, South-Central Semi-Arid Prairies, Texas Louisiana Coastal Plains, and Tamaulipus-Texas Semi-Arid Plain, which overlap or expand upon other Great Plains designations. The region is about 500 mi (800 km) east to west and 2,000 mi (3,200 km) north to south. Much of the region was home to American Bison herds until they were hunted to near extinction during the mid/late 19th century. It has an area of approximately 1,300,000 km2 (500,000 sq mi). Current thinking regarding the geographic boundaries of the Great Plains is shown by this map at the Center for Great Plains Studies, University of Nebraska–Lincoln. The term "Great Plains", for the region west of about the 96th or 98th meridian and east of the Rocky Mountains, was not generally used before the early 20th century. Nevin Fenneman's 1916 study, Physiographic Subdivision of the United States, brought the term Great Plains into more widespread usage. Before that the region was almost invariably called the High Plains, in contrast to the lower Prairie Plains of the Midwestern states. 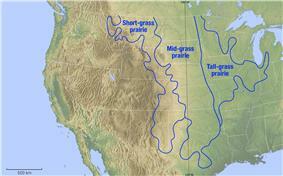 Today the term "High Plains" is used for a subregion of the Great Plains. Central Texas section – central Texas. During the Cretaceous Period (145-66 million years ago), the Great Plains were covered by a shallow inland sea called the Western Interior Seaway. However, during the Late Cretaceous to the Paleocene (65-55 million years ago), the seaway had begun to recede, leaving behind thick marine deposits and a relatively flat terrain which the seaway had once occupied. During the Cenozoic era, specifically about 25 million years ago during the Miocene and Pliocene epochs, the continental climate became favorable to the evolution of grasslands. Existing forest biomes declined and grasslands became much more widespread. The grasslands provided a new niche for mammals, including many ungulates and glires, that switched from browsing diets to grazing diets. Traditionally, the spread of grasslands and the development of grazers have been strongly linked. However, an examination of mammalian teeth suggests that it is the open, gritty habitat and not the grass itself which is linked to diet changes in mammals, giving rise to the "grit, not grass" hypothesis. Paleontological finds in the area have yielded bones of woolly mammoths, saber-toothed tigers and other ancient animals, as well as dozens of other megafauna (large animals over 100 lb (45 kg)) – such as giant sloths, horses, mastodons, and American lion – that dominated the area of the ancient Great Plains for millions of years. The vast majority of these animals went extinct in North America at the end of the Pleistocene (around 13,000 years ago). In general, the Great Plains have a wide variety of weather through the year, with very cold and harsh winters and very hot and humid summers. Wind speeds are often very high, especially in winter. Grasslands are among the least protected biomes. Humans have converted much of the prairies for agricultural purposes or to create pastures. The Great Plains have dust storms mostly every year or so. The 100th meridian roughly corresponds with the line that divides the Great Plains into an area that receive 20 inches (510 millimetres) or more of rainfall per year and an area that receives less than 20 in (510 mm). In this context, the High Plains, as well as Southern Alberta, south-western Saskatchewan and Eastern Montana are mainly semi hot steppe land and are generally characterised by rangeland or marginal farmland. The region (especially the High Plains) is periodically subjected to extended periods of drought; high winds in the region may then generate devastating dust storms. The eastern Great Plains near the eastern boundary falls in the humid subtropical climate zone in the southern areas, and the northern and central areas fall in the humid continental climate. Many thunderstorms occur in the plains in the spring through summer. The southeastern portion of the Great Plains is the most tornado active area in the world and is sometimes referred to as Tornado Alley. The Great Plains are part of the floristic North American Prairies Province, which extends from the Rocky Mountains to the Appalachians. The first Americans (Paleo-Indians) who arrived to the Great Plains were successive indigenous cultures who are known to have inhabited the Great Plains for thousands of years, over 15,000 years ago. Humans entered the North American continent in waves of migration, mostly over Beringia, the Bering Straits land bridge. Historically the Great Plains were the range of the bison and of the culture of the Plains Indians, whose tribes included the Blackfoot, Crow, Sioux, Cheyenne, Arapaho, Comanche, and others. Eastern portions of the Great Plains were inhabited by tribes who lived in semipermanent villages of earth lodges, such as the Arikara, Mandan, Pawnee and Wichita. 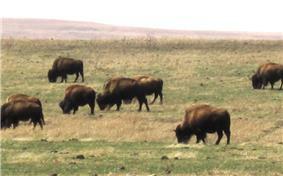 Great Plains in North Dakota c.2007, where communities began settling in the 1870s. With the arrival of Francisco Vásquez de Coronado, a Spanish conquistador, the first recorded history of encounter between Europeans and Native Americans in the Great Plains occurred in Texas, Kansas and Nebraska from 1540-1542. In that same time period, Hernando de Soto crossed a west-northwest direction in what is now Oklahoma and Texas. Today this is known as the De Soto Trail. 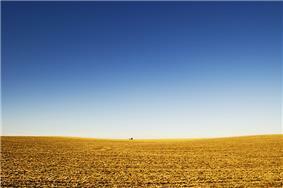 The Spanish thought the Great Plains were the location of the mythological Quivira and Cíbola, a place said to be rich in gold. Over the next one hundred years, founding of the fur trade brought thousands of ethnic Europeans into the Great Plains. Fur trappers from France, Spain, Britain, Russia and the young United States made their way across much of the region, making regular contacts with Native Americans. After the United States acquired the Louisiana Purchase in 1803 and conducted the Lewis and Clark Expedition in 1804-1806, more information about the Plains became available and various pioneers entered the areas. Manuel Lisa, based in St. Louis, established a major fur trading site at his Fort Lisa on the Missouri River in Nebraska. Fur trading posts were often the basis of later settlements. 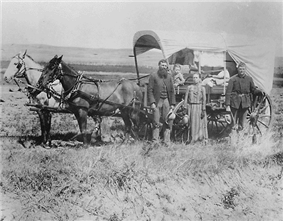 Through the 19th century, more European Americans and Europeans migrated to the Great Plains as part of a vast westward expansion of population. New settlements became dotted across the Great Plains. The new immigrants also brought diseases against which the Native Americans had no resistance. Between a half and two-thirds of the Plains Indians are thought to have died of smallpox by the time of the 1803 Louisiana Purchase. 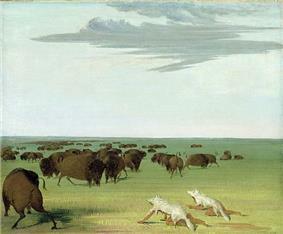 After 1870, the new railroads across the Plains brought hunters who killed off almost all the bison for their hides. The railroads offered attractive packages of land and transportation to European farmers, who rushed to settle the land. They (and Americans as well) also took advantage of the homestead laws to obtain free farms. Much of the Great Plains became open range, or rangeland where cattle roamed free, hosting ranching operations where anyone was theoretically free to run cattle. In the spring and fall, ranchers held roundups where their cowboys branded new calves, treated animals and sorted the cattle for sale. Such ranching began in Texas and gradually moved northward. 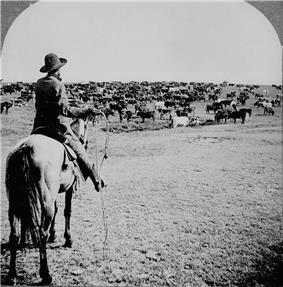 In 1866-95, cowboys herded 10 million cattle north to rail heads such as Dodge City, Kansas and Ogallala, Nebraska; from there, cattle were shipped eastward. Many foreign investors, especially British, financed the great ranches of the era. Overstocking of the range and the terrible winter of 1886 resulted in a disaster, with many cattle starved and frozen to death. Theodore Roosevelt, a rancher in the Dakotas, lost his entire investment; he returned east to reenter politics. From then on, ranchers generally raised feed to ensure they could keep their cattle alive over winter. To allow for agricultural development of the Great Plains and house a growing population, the US passed the Homestead Act of 1862: it allowed a settler to claim up to 160 acres (65 ha) of land, provided that he lived on it for a period of five years and cultivated it. The provisions were expanded under the Kinkaid Act of 1904 to include a homestead of an entire section. Hundreds of thousands of people claimed such homesteads, sometimes building sod houses out of the very turf of their land. Many of them were not skilled dryland farmers and failures were frequent. Much of the Plains were settled during relatively wet years. Government experts did not understand how farmers should cultivate the prairies and gave advice counter to what would have worked. Germans from Russia who had previously farmed, under similar circumstances, in what is now the Ukraine were marginally more successful than other homesteaders. 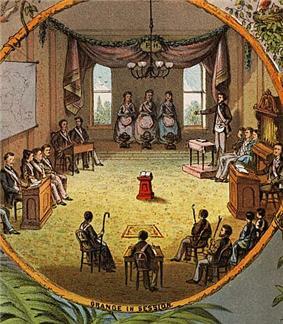 The Dominion Lands Act of 1871 served a similar function for establishing homesteads on the prairies in Canada. Withdrawal rates from the Ogallala Aquifer. The railroads opened up the Great Plains for settlement, for now it was possible to ship wheat and other crops at low cost to the urban markets in the East, and Europe. Homestead land was free for American settlers, railroads sold their land at cheap rates to immigrants in expectation they would generate traffic as soon as the farms were established. Immigrants poured in, especially from Germany and Scandinavia. On the plains, very few single men attempted to operate a farm or ranch by themselves; they clearly understood the need for a hard-working wife, and numerous children, to handle the many chores, including child-rearing, feeding and clothing the family, managing the housework, feeding the hired hands, and, especially after the 1930s, handling the paperwork and financial details. During the early years of settlement in the late 19th century, farm women played an integral role in assuring family survival by working outdoors. After a generation or so, women increasingly left the fields, thus redefining their roles within the family. New conveniences such as sewing and washing machines encouraged women to turn to domestic roles. The scientific housekeeping movement, promoted across the land by the media and government extension agents, as well as county fairs which featured achievements in home cookery and canning, advice columns for women in the farm papers, and home economics courses in the schools. Bonnifield, Paul. The Dust Bowl: Men, Dirt, and Depression, University of New Mexico Press, Albuquerque, New Mexico, 1978, hardcover, ISBN 0-8263-0485-0. Courtwright, Julie. Prairie Fire: A Great Plains History (University Press of Kansas, 2011) 274 pp. Eagan, Timothy. The Worst Hard Time : the Untold Story of Those Who Survived the Great American Dust Bowl. Boston : Houghton Mifflin Co., 2006. Gilfillan, Merrill. Chokecherry Places, Essays from the High Plains, Johnson Press, Boulder, Colorado, trade paperback, ISBN 1-55566-227-7. Hurt, R. Douglas. The Big Empty: The Great Plains in the Twentieth Century (University of Arizona Press; 2011) 315 pages; the environmental, social, economic, and political history of the region. Hurt, R. Douglas. The Great Plains during World War II. University of Nebraska Press. 2008. Pp. xiii, 507. Raban, Jonathan. Bad Land: An American Romance. Vintage Departures, division of Vintage Books, New York, 1996. Winner of the National Book Critics Circle Award for Nonfiction. ^ Fenneman, Nevin M. (January 1917). "Physiographic Subdivision of the United States". ^ Brown, Ralph Hall (1948). Historical Geography of the United States. New York: Harcourt, Brace & Co. pp. 373–374. ^ "Ice Age Animals". Illinois State Museum. ^ "A Plan For Reintroducing Megafauna To North America". ScienceDaily. October 2, 2006. ^ "First Americans arrived 2500 years before we thought – life – 24 March 2011". New Scientist. Retrieved 2014-02-12. ^ Hanna, Bill (2010-08-28). "Texas artifacts 'strongest evidence yet' that humans arrived in North America earlier than thought". Star-telegram.com. Retrieved 2014-02-12. ^ Rees, Amanda (2004). The Great Plains region. Greenwood Publishing Group. p. 18. ^ "Emerging Infections: Microbial Threats to Health in the United States (1992)". Institute of Medicine (IOM). ^ Deborah Fink, Agrarian Women: Wives and Mothers in Rural Nebraska, 1880–1940 (1992). ^ Karl Ronning, "Quilting in Webster County, Nebraska, 1880–1920", Uncoverings, 1992, Vol. 13, pp. 169–191. ^ Nathan B. Sanderson, "More Than a Potluck", Nebraska History, Fall 2008, Vol. 89 Issue 3, pp. 120–131. ^ "Legendary Texas oilman embraces wind power". ^ Fahey, Anna (2008-07-09). "Texas Oil Man Says We Can Break the Addiction". Sightline Daily. Retrieved 2008-08-24. 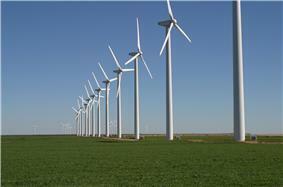 ^ "T. Boone Pickens Places $2 Billion Order for GE Wind Turbines". Wind Today Magazine. 2008-05-16. Retrieved 2008-08-24. ^ Block, Ben (2008-07-24). "In Windy West Texas, An Economic Boom". Retrieved 2008-11-05. Sweetwater was a struggling town typical of the Plains, steadily losing businesses and population, until wind turbines came to the surrounding Nolan County. Wind power brought jobs to local residents, along with royalty payments to landowners who leased sites for turbines, reversing the town's population decline. Pickens claims the same economic benefits are possible throughout the Plains, which he refers to as North America's "wind corridor." The Great Plains contribute substantially to wind power in the United States. In July 2008, oilman turned wind-farm developer T. Boone Pickens called for the U.S. to invest $1 trillion to build an additional 200,000 MW of wind power nameplate capacity in the Plains, as part of his Pickens Plan. Pickens cited Sweetwater, Texas as an example of economic revitalization driven by wind power development. From the 1950s on, many areas of the Great Plains have become productive crop-growing areas because of extensive irrigation on large landholdings. The United States is a major exporter of agricultural products. The southern portion of the Great Plains lies over the Ogallala Aquifer, a huge underground layer of water-bearing strata dating from the last ice age. Center pivot irrigation is used extensively in drier sections of the Great Plains, resulting in aquifer depletion at a rate that is greater than the ground's ability to recharge. The region roughly centered on the Oklahoma Panhandle, including southeastern Colorado, southwestern Kansas, the Texas Panhandle, and extreme northeastern New Mexico was known as the Dust Bowl during the late 1920s and early 1930s. 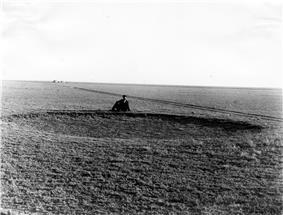 The effect of an extended drought, inappropriate cultivation, and financial crises of the Great Depression, forced many farmers off the land throughout the Great Plains.